so I bought a custom CM16 with a bunch of stuff yesterday (it is on its way and should be with me by Monday) for just £150, which is great! Decided to get something a bit more widely customisable in contrast to my old G36C. Now, it has parts already painted, but I am going to be using the spare handguard and spare stock which are in the picture - the ones that aren't painted. So, does anyone have any suggestions, or should it just be left alone and the grip replaced so that it doesn't have paint? Quite happy with the gun if I am honest, and I want to get some kind of sight. Was thinking an EOTech, but have heard that the gun would need to be modified for that - mainly the front sight. So yeah, leave it as is (with the spare handguard and stock in the picture and just buy a matching grip) or should something be done? Not too worried about practicality, just want something enjoyable to look at. 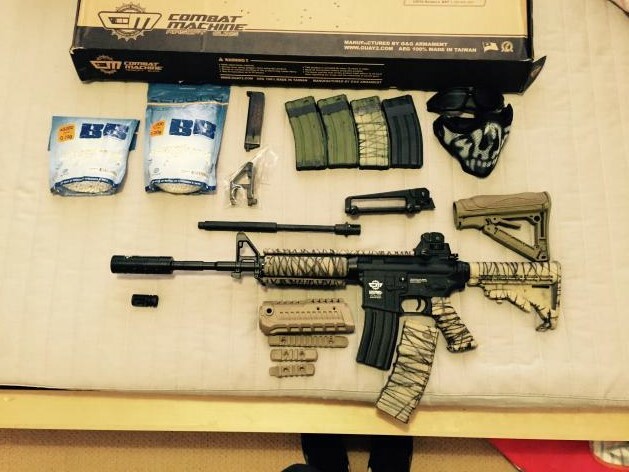 Shouldn't need modification for an EOTech, if anything the holographic and front sight post will co-witness? I have a red dot sight on my M4 and it doesn't get in the way. That is what I thought, but the guy that sold it to me and another on AF UK said it'd need modification. If it causes no problems for me, then well, that's all good Couldn't hurt having a bit more aim assistance. Nope, won't need to be touched. The front sight will co-witness fine. If you DO decide to remove it then yes you could be in for some work but you don't NEED to remove it. Try it out, you may decide you just don't like the co-witnessing thing. Well, glad that's all cleared up He sounded incredibly sure it needed modification which is why I was confused. Even said "I tried an EOTech before but I couldn't use it so I sold it" but I couldn't understand the problem. You say now your going for a look nice effect, I was EXACTLY the same a few months ago, you end up buying all this gun jewelry which in the end makes it look worse as you put more and more on and don't know when to stop. I would recommend leaving it alone if your happy. Once you have used it you will find things you want to do, I have changed my idea and opinion of my Raider about 4 times since buying the bloody thing and have a whole box full of bits I bought, put on and then removed from the gun.